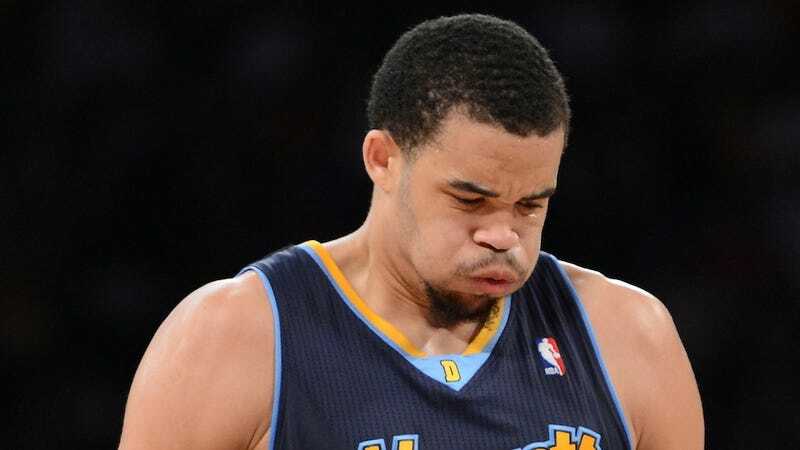 JaVale McGee invited 10 Twitter followers to a free lunch with him at Chipotle yesterday. And in typically JaVale fashion, the invitation was well-intentioned, but poorly thought out, producing a hilarious result. Given just five minutes notice, only one fan made it to Chipotle: Andy Mathisen, who doesn't even list the Nuggets among his fan allegiances in his Twitter bio. Mathisen took to Twitter to thank McGee, "one of his favorite Nuggets," for the free lunch. Maybe had McGee had just given him the other nine burritos, Mathisen would have called McGee his favorite Nugget. UPDATE (3:46 p.m.): McGee's learned from his mistake and is now offering another 10 free lunches (and himself a chance at redemption), this time with an hour's notice. If you're in Denver, head to the Noodles & Company next to the now-infamous Chipotle on 16th.